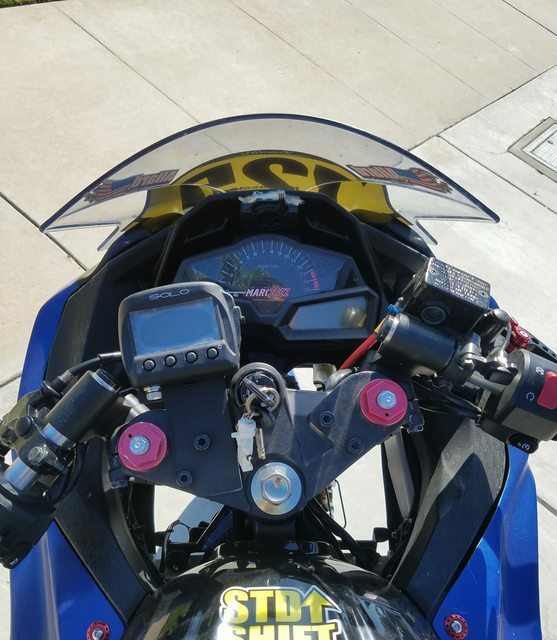 I figured this would be an interesting way to document anything that happens to the bike as well post up videos of trackdays to come. After a few years away from riding due to grad school, I finally got a bike last year. I'm open to any critiques or insights from people also if anyone bothers to look at my videos. Haha. I did one trackday in 2015 at Shenandoah at Summit Point. It was a ton of fun and I met some great folks. I'm hoping to do more this coming year. Transportation method: F-150 from RelayRides. This was a bad call. I did not realize how tall the beds are for the new F-150s now. Progress: For a first time back and first time at Shenandoah, I thought it went decently. The stock IRC tires were fine at the slow pace I was going. I was able to get from a 2:41 lap in the first session to a 2:17 in the last session. My body positioning was all kinds of messed up. I did not remember to rotate my inside foot a bit, so I could not get my knee out. I kept wondering what was wrong when I touched down my toe sliders twice, but then I watched Ken Hill's foot position video and it all came back to me. We'll see if I can actually apply it next time out. I am putting on track fairings for track days. This way, I will worry less about binning it, while keeping the oem fairings for street days. I bought the bike with a lot of nice modifications already, but I still got into a give a mouse a cookie syndrome while browsing the forums and ebay. The prices on some things were too good for me to say no. I'm hoping to drop some more time, and maybe go TPM racing after another season of trackdays. I'm going to try stop at this, and actually learn to ride the thing. I've already told myself that I won't allow even a rattlecan paint job until I can get significantly faster and more consistent. Now, I'm just looking to getting better at my riding. PM sent. It'll be cool to meet other 250/300 riders this year. I didn't wanted to deal with dremeling fiberglass in my apartment complex garage, so I had the bodywork done by a local shop. It is now back and ready for action. Cut outs for the sliders were unnecessarily done, but oh well, not a big deal. I am thinking I'll just sticker over it. Spent the past weekend doing two days at VIR with EvolveGT. Even though it meant taking Monday off, I knew I had to see VIR. It is by far the swankiest track I've been to. Since getting back to riding, I have been feeling like there is something wrong with my body positioning. However, I haven't been able to figure out what that something, or many things, is. This weekend, the coaches at Evolve were awesome, and helped me work on a plan to improve my body position. Although I felt like I was moving around on the bike, they showed me that it was not the case at all. However, with a few sessions and a tail mounted GoPro, I made some improvements (photos are the same corner from first vid session and last vid session) and will hope to keep working on it. The bike ran flawlessly. The suspension is definitely soft as I could feel big movement with elevation changes while cornering. But overall, I really enjoyed riding the bike. Getting a 300 was definitely the right call for my return to riding. I pushed probably more than I should have during one session, and then dialed it back a bit to focus on working on my body position with the video recordings. Still, on a gopro estimate, it looks like I was comfortably running a 2:06ish laptime at VIR. Not sure how that stacks up on the 300. I watched your video and almost spit out my drink. I have been stuck behind that guy before at Shenny! He is so slow in the turns and guns it in the straights. New updates after a long break. I ended up doing 3 more trackdays, two at Shenandoah and one at Summit Point Main. Of course, these are all just my thoughts on my journey of self-discovery. I definitely welcome thoughts of the experienced. Vehicle: Zipvan - definitely easier to load than an F150. This was a super cold day. It was at freezing in the morning, and the turn out was really low. The afternoon got a lot better and got into the 50s. Grip was interesting in the morning, as it was the first time I've ever had the rear of the 300 step out while on the gas at corner exit. I'm not even sure what to do with this day, to be honest. Talking to different coaches, I got differing advice on line selection. I did some lead/follow, adjusting some of my lines to try straightening out some sections and double apexing certain corners. Some of it seemed to work better. However, I then got a video review by a coach saying my lines were bad. I'm honestly not even sure what to do with this day. I'm just dropping the changes, and staying with single apexing things until I get faster. Overall, it was a fine day to get back to Shenny. I was not a fan of the course layout, with the range straight and shortcut after the bridge. I will probably stick with MXC or TPM for Shenandoah. Holy hell were there a lot of crashes. I think the majority of sessions ended due to red flags. This day was dedicated to body positioning. Since the talks on body positioning at VIR, I have tried to focus on pre-positioning and getting off the bike more. I was able to two sessions in with Bruce. He was great and was making exaggerated movements to tell me to get lower on the tank. Of course, I thought I was lower than I actually was. I only ran the cam on the tail, so there's no good footage. Laptime: 2:14 with traffic. Compared to my first time on Shenny, this is a 4 second drop in laptime. Lesson learned: Get low on the tank. Even if you think you're low, you're probably not. I did not think I would enjoy Main as much as I did. I was expecting to just get blown by over and over again by the bigger bikes without much cornering time. I actually really liked turns 1, 3, and 10. I was mentally psyching myself out with corner entry speed, and slowing down much more than I should have, but I felt like I slowly worked on it session by session. I found myself still having the same problem of being too upright. I was also maybe stiff arming my inside arm a bit, so I was not dropping my upper body as much as I could have. This will be something to work on. At least now, I can consistently get my outside forearm on the tank. Also, I did not notice it nearly as much until reviewing the video, but I am making a lot of mid-corner adjustments. This is definitely something I will have to focus on to avoid doing. Fun fact: I had a stuck throttle in one session. It is nerveracking to downshift two gears, let go of the clutch, and not slow down relative to the bike in front. I pulled the bar side throttle housing apart, and it seemed okay. Afterwards at home, I found that the lower throttle body adjustments were completely loose. Not sure when this happened or how. But it seems like everything is back in spec. Laptime: 1:48. I was definitely braking way earlier for turn 1 than necessary. I improved this to the third brake marker in a later session, but I did not get clean track to put a lap together. Lesson learned: Still need to get lower on the tank. I need to relax the inside arm more to let it bend more, and let more of the outside arm rest on the tank in order to get the upper body lower. The next day will be NYST on July 4th weekend with EvolveGT. Get my upper body lower by relaxing my inside arm more and getting more of my outside arm to rest on the tank. I'm also at about 1500(?) (installed by previous owner) on the DR2s. They've been great so far. But I have a pair of S20evos that will get put on at some point. Another long stretch before updates. Since the last time, I've visited NYST, Shenny, and VIR. Doing VIR with California Superbike School totally changed up my riding position. For sure, it will take some time to adjust. Takeaway: Less coasting. Be more aggressive on the throttle. Fun weekend for me, not so much for my buddy. We went up for two days, but my buddy had an incident on Day 1. We ended up spending the rest of the day in two different hospitals. Comment of the day by a nurse when we walked in with gear still on: What are they, stormtroopers? Day 2, I had a great time with Evolve as usual. Was lucky to get a couple tows and try to figure out the lines. NYST is a lot of fun, but a bit far from DC. One big takeaway was how much more aggressive I can be on the throttle. Especially with a 300, that drive makes such a huge difference. Brett from Evolve was awesome at walking me through sections where I should be much more aggressive on the throttle. This was supposed to be VIR day, but VIR had paving delays so I ended up going to Shenny instead. It was a solid day hanging out with great people. This was just a tune up day before two days at California Superbike School, so I was not pushing hard. "Go slow to go fast" did happen a bit here. I was pushing less than my previous times at Shenny, and still somehow dropped 5 seconds off my personal best. Takeaway: Body positioning. Preposition early on the brakes. Switch to clutchless shifting. More upper body movement, less lower body movement. There was a lot going on here. I had a great time going through levels 3 and 4. Working with Gerry in level 3, and Dylan and Ash in level 4 was a great experience, and Cobie was awesome with taking time out of his day for a random off-track drill. I spent a lot of time asking questions on body positioning, as I've been having a hard time with body positioning on the 300. The body positioning issue also ties in with some unconscious bar inputs that I've been doing as I haven't been completely relaxed on the bike when in a hang off position. Level 4 was perfect for this as I could focus on the issues that I wanted to. The days were great, but the new track surface absolutely tore up my tires. I've done 8 days on a set of DR2s and had about 50% tread left. I'm now down to the wear bars on the rear after 2 days at VIR. S20evos with a 150 on the rear will be going on next. Overall lower body position - This year, I've been hanging off much more aggressively, but it has affected my connection with the bike. Working with the CSS guys, I switched to a less off-seat position, so that I can keep a better lock on the tank with the outside leg. Instead, the focus was to try to get the upper body off the bike a bit more in exchange for the lower body. Inside foot position - Previously, I've been riding with my inside foot angle at a 45 angle with the outer toes hanging off over the edge of the peg. After some discussion, I switched to keeping my foot parallel with the bike, but tilting it at a 45 degree angle against the rearset and peg. Having Jon and Dylan working with me on my bike, they showed me that I could get the same, if not better, knee positioning with the new lower body and foot position since I wasn't rotating around the tank as much as before. Prepositioning - This probably messed with me the most the entire time. Previously, I've been getting my downshifts done before prepositioning before corner entry. Talking about it this time, I switched to prepositioning my lower body before initiating downshifts and braking. The new positioning, especially on righthanders, put my shifting foot out of my old comfort zone. I think I was definitely helping to stabilize the bike by prepositioning earlier, but I also had to dial back my braking a bit to have time to adjust to the potentially downshifting issue. I still ended up overcooking it into 1, relative to my comfort level, once and ran way wide due to the whole preposition/braking/downshifting changes. Clutchless - I've previously played around with clutchless shifting on the street, but I switched over to clutchless shifting after a talk with Cobie. I have previously not done this because I was worried that I might miss a gear on a downshift and overcook a corner. But after trying it out, i definitely feel like I could solidly predict the shifts and I was using less of my mental capacity on my shifts. All in all, I had a great time and made a lot of changes to my riding. I hope these changes will make me better with less improper rider inputs. Even dialed back, I was 2 seconds faster than last time at VIR. After seeing another vortex user's crash and frame damage, I switched back to the OEM footpegs. I got a set of Yoshimura risers and PSR footpegs for the OEM footpegs. S20evos with a 150 rear. Pitt Race for the first time next month. Thanks, and I have definitely been making an effort to explore the east coast tracks. It has been a lot of fun to travel around and take in the sights. I've been on a "if I don't do it now, when will I" kick this year. I hope to be out more and traveling myself one of these days! Sure is nice to live experiences, and see other views ! It's been a little while since the last update. New update, I definitely feel like this year of riding with CSS and EvolveGT has improved my riding dramatically. Takeaway: The updated body/foot position to hang off less works. Clutchless shifting also helps keep the bike settled. After CSS, I did two days at Pitt Race (first time) where I was able to get more comfortable with prepositioning. The flowing back section of the track also helped build up my confidence, and I was finally able to confidently get my knee down without worrying about my toes! It was also super cool to get a tow from KTM cup champion Brandon Paasch. He was fast on a 250. It was also really cool doing some lead/follow with a new friend on a liter bike. Talk about cool and disheartening to get passed by a liter bike doing a wheelie. Haha. Takeaway: I'm still giving up a lot of momentum/drive in a ton of corners. Have to work on being more aggressive on the throttle. Still, the best was yet to come with this past weekend at NCBike with EvolveGT. It was my first time there, and I really enjoyed the track. Wished they'd have more than one shower though. Haha. The long constant radius turns proved to be the perfect practice grounds for playing with my body position. The prepositioning, the right-hander clutchless downshifts, and the knee position just all clicked. It was two perfect days of riding. The changes to my riding position completely revamped my riding style. I was confident in using my knee as a lean angle gauge, and didn't have to worry at all about dragging my feet or pegs. I felt solid running at the course, though I definitely recognized that I was giving up a ton of drive in certain corners. I just need to get myself to commit. The S20evos have great grip that I should just trust. Ran a 1:45 while getting towed around. Also, finally got a cool photo. Poseur status. Still need to work on getting my head lower and to the outside more, but it's a work in progress. 1) Maybe NCBike to close out the year, depending on the weather. 2) Try out tire warmers. I picked up a set of MJMotoGear warmers. I'm debating trying out CCS or the local trackday race series next season, and wanted to play around with warmers while at a trackday. I was going to wait a bit to get faster, but everyone just kept telling me that the fastest way to get faster is to just jump in. 3) Winter paintjob for the bike! I'm debating between pearl white/day glo orange and black/lime rock green. Last days and 2016 year end reflections. 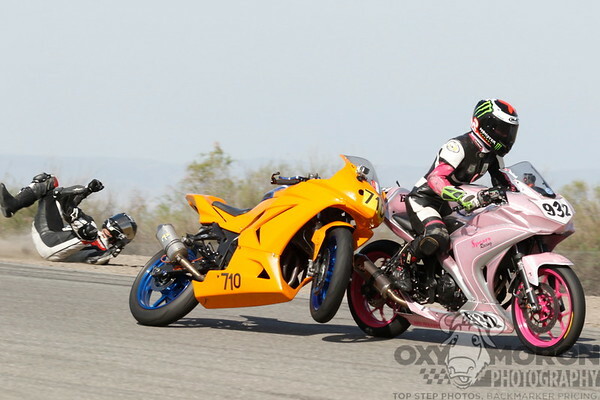 TL;DR: California Superbike School and EvolveGT are fantastic. Trackdays are fun. Bike is significantly faster than the rider. Takeaway: I still need to drop that inside elbow and get my head lower and more outboard. I'm probably subconsciously maintaining some bar pressure. Did the last two days of the season at NCBike with Evolve this month. After four trackdays at NCBike, I can safely say that I love that track. The grip level is fantastic and the long sweepers are wonderful for working on body position. The track just flows. I tried to focus on T1-T4 this time, and definitely improved. I thought I was significantly faster in certain sections, but I only dropped a little over a second on my personal best into the 1:44s. I would like to go racing next season, and the lap record is a 1:36, with the pack running around 1:38-1:41, so I still have a ways to go. I found myself snicking into 6th gear on the back side, and going down 3 gears clutchless at T11 was problematic. The blips were just slowing me down a bit as I wasn't as hard on the brakes as possible. While I've been riding clutchless everywhere else with 1 or 2 gear shifts, I'm thinking next year I'll need to try both clutched and clutchless for 3 gear downshifts to see how I feel. Video of the last session of the day. Checked throttle on the straights in the middle of the session, as I was trying to get a tow from a coach on a 300. Turned out he hit a braking zone false neutral and had pitted in already. Overall, the bike was kept fairly stock. I'm trying to see how far I can get, and learn how to "feel" the bike. I want to learn how to get to the limit of the bike before upgrading additional bits and pieces. Black Friday deals on Ohlins were definitely tempting though... Haha. I did end up buying an ebay-special lever guard set so I can finally get a brake lever guard. I definitely made a ton of improvement after getting back into the sport. Riding the 300 has made me a significantly safer and faster rider than my R6 or CBR600RR did. 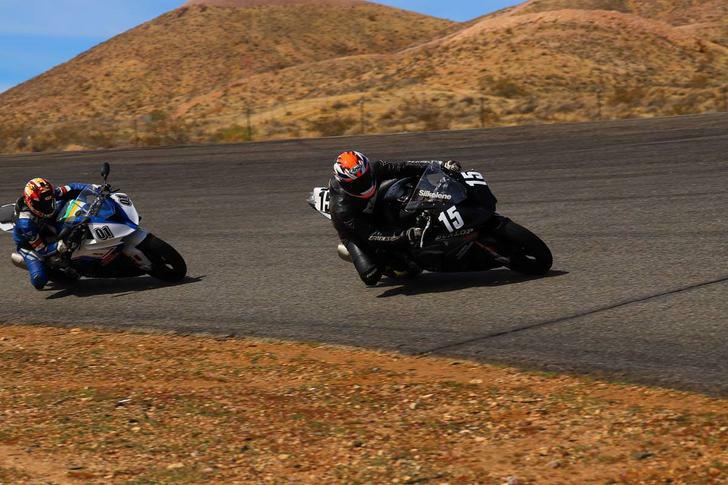 This year, I did levels 3 and 4 at California Superbike School and rode a number of days with EvolveGT. Before, I was able to get away with shoddy body positioning on the supersports. But the riding position on the 300 really highlighted issues (I was touching toe/peg before knee initially), and spending two days at CSS really helped sort out those issues. NCBike with EvolveGT was perfect for giving me the time to methodically work on the body positioning changes. On that note, all the coaches at EvolveGT have been amazing this year. Overall, I am now hanging off the bike better. Thanks to Jon Groom and Dylan Code at California Superbike School in particular for helping show me the light. I went to the extreme at the start of the year for hanging off, and then tempered my lower body at CSS. It wasn't just "do this," but Days of Thunder style. Having me show them what I was doing, and then moving me around while keeping track of certain key measurements was extremely helpful. I ended up with a better knee position while hanging off less and getting a more secure lock on the tank. I still need to work on getting my head more out to the side and lower (hook turn!) but that's progress for another year. Relax that inside arm and drop lower on the tank to get the head outboard more. 1) Work on references points for corner entry. I feel like I depend a lot on boards and trackday cones, which can be shifted. Having listened to Kevin Schwantz, he mentioned looking for on-track things more so he's not looking away. 2) Not tunnel visioning on the bike ahead of me, but looking through. Working on my visuals and reference points. Some corners, like T2 at NCBike, I would find myself adding lean angle after going in. All in all, a fantastic year with great people at the track. Bike is in one piece, and still able to learn. Was a heck of a year! I'm finally allowing myself to paint the bike this year. I had a thing about keeping it primer grey until I felt like I wasn't slow as molasses. To that end, I'm patching holes and openings in the bodywork to meet CCS spec. Thanks for everyone who answered my question on the belly pan! I used a West System 105K fiberglass repair kit, which had enough to cover two 2.5 inch diameter holes on the upper and the kickstand cut out. The fiberglass work turns out fairly decently. It's not the worst looking job in the world. Next up, I will have to sand down to smoothness, primer, and then paint. The weather in DC looks to be variable, so I may not actually paint until mid-March. Paint-wise, I ended up selecting Spraymax 1K base and a 2K gloss clear coat. Spraymax recommends a minimum temperature of 60F to spray. The new colors will be BMW Estoril Blue and BMW Sapphire Black. Hopefully I'll have it painted by April. To run an oil containment belly pan and also keep the kickstand for normal days, I bought used OEM uncontained lowers. The good thing is that the Catalyst Composites upper matches pretty well with the OEM lower. I drilled out the lowers and am running Dzus pro fasteners now, so it should be a quick change out to the belly pan at the track for no-kickstand days. It means I make poor financial decisions"
Also, got this little clip from a control rider showing the progress from my first day back in 2016 with my last day of 2016. A long overdue post/posts. So 2017 is three quarters over, and I've been running around in the game of life. I ended up changing jobs, and moving back to California after seven years on the east coast. The 300 has been sitting for a while, but it will be coming out to play at Laguna Seca in November. I've also got two other friends coming out on 300s, so it should be a hoot to be back. It'll also be my second time ever at Laguna (first time being my very first time on track back in 2007 on a 600), so I'll be intrigued to see how I compare. But 2017 mid-season recap. I focused on running 6 trackdays at NJMP and did four CCS races there before the big move. After finally getting a little bit of pace last year, I allowed myself to paint the bike over the winter. I spray canned in an alley next to my downtown DC condo. (I am glad to have a garage and backyard again). I think it is an okay 10 feet paint job. I would recommend brighter, more distinctive colors though. My friends' main comments were it was hard to pick out which bike I was (my leathers are black also). Absolutely love these guys. EvolveGT will be the trackday group I miss most by moving back to California. Ran the first ever Motogladiator race, and got 3rd in class. It was amazing to get a front row seat (a.k.a. getting lapped) to see Brandon Paasch getting his rear tire to spin up post-apex. Day 2. Wet track in the morning. What do I do? Push like an idiot and "fix" my paint job after less than 48 hours from the start of the season. If you happen to still see this mark at 12B on VIR North, you're welcome for the reference point. Huge shout out to my friend for letting me strip parts off his back up, a.k.a. his wife's 300, to let me run the rest of the day. Takeaways: No matter how quick you think you are getting on the gas, odds are you can still twist it a little faster. 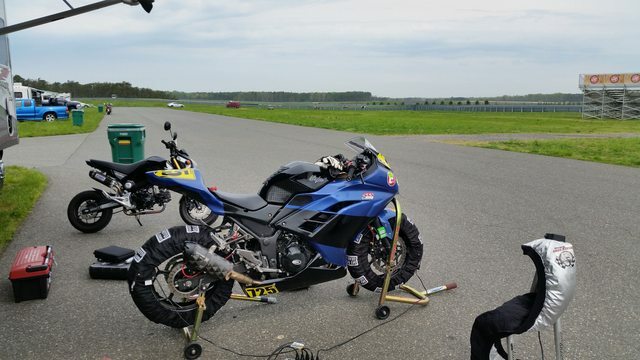 After deciding on going back to California, I focused on making it to the NJMP CCS round. I spent three of four weekends in April at NJMP. I absolutely love Thunderbolt. Also, as someone who favors right hand turns, I love clockwise courses. It was truly amazing how much racing helped my lap times. From trackday to first race, I went from a 1:50 to a low 1:48. In my last race, I went down to a mid 1:47. Three seconds in one weekend after six days at the track was awesome for me. Of course, that was still only good enough for the back middle of the back. But it's a work in progress. This was the first race, but definitely the most interesting and entertaining race. I definitely need to work on my starts, but it did feel good to be able to pass a few people in the race. There was an incident at 2:40 with some other riders. Thankfully, everyone walked away. The back half from lap 4 onward was a lot of fun back and forth with the rider on the white and green. She beat me to the line yet again after the motogladiator race at VIR. 13th out of 24. And a beauty shot of the bike. Now that I'm back in California, I've realized I probably need to buy a MX bike and really learn to get faster. Just did SoCal Supermoto, and it was another refresher on just how much more I still have to learn about riding. Last futzed with by Mechanikrazy; November 10th, 2017 at 03:51 PM. Hey, paint job looks awesome! See you at Laguna in Nov! Nice paint! And welcome back to CA. Awesome! I'll be riding in intermediate with the bike, and my friends will be on the FLAP rentals. Please say hello if you see me floating around the paddock! Also, side question for you, does the pit area have electrical boxes for plain old 120v? I have been running warmers out east from boxes rather than a generator. All right. Stock exhaust back on for Laguna. Thank God for getting a stock exhaust while on the east coast. This one is a bit rusty and sounds louder than I recall, but we'll hope it clears sound check. And new toy: Aim Solo! "If you want to get faster, get a laptimer. If you want to stop having fun on a motorcycle, get a laptimer." Some aluminum, some Rustoleum, and now we have predictive timing. @JacRyann Are you going to be at Laguna on Sunday, or are you running Monday/Tuesday? Unfortunately, I'll only be there Sunday. Hopefully, I'll be pitting next to the FeelLikeAPro guys. Sorry, on Phoenix visiting in-laws. Only doing Monday & Tuesday. Laguna hasn’t changed much in last 20-yrs. Dip in turn-6 is still there, so be careful. Hope you had a great time in Phoenix and at Laguna. Hopefully will run into you at some point next year. I have a soft spot for this place. 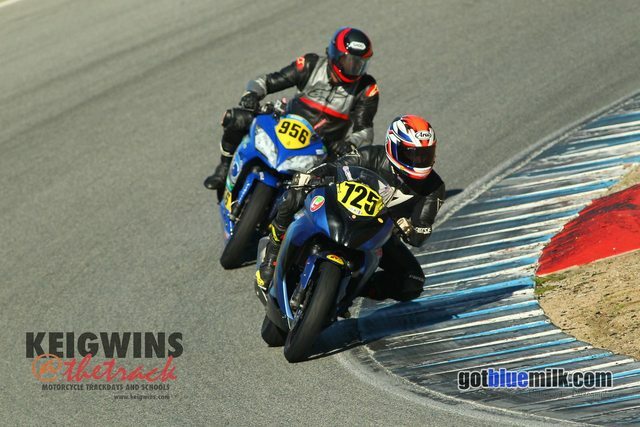 My first ever time on track was California Superbike School level 1 at Laguna way back in 2007. I have never been back since that day, until this past weekend. I still remember that day was so fun watching Elena Myers lapping everyone in her riding group. Onward, it was my first time with Keigwin's and my first time back on the 300 since April. Some trackday groups on the West Coast have red flags mean track stoppage whereas East Coast red flags mean everyone pits in. I actually like this rule as it probably significantly shortens the time to roll the ambulance and gives at least a fighting chance before permanent damage if there is heart stoppage. Anyways, onward to the trackday. I had friends renting the FLAP Ninja 300s, so we were able to grid up together and have a blast out there. Even if we were getting blitzed on the straight, it was fun to be buzzing down the straight in a pack of 4-5 drafting 300s. I have always favored right hand turns, which worked out fine on the East Coast where almost all of the tracks were clockwise. But this meant I was giving up a lot of ground in turns 5, 6, and the corkscrew. We'll slowly work on it next year. And had a baby front end slide moment in T3 that scared me a ton. First time I've felt the front end go loose, pressure increase on my knee, and then feel the front end track again. Yes... I've felt the front end go loose before... and then have the bike separate from me... Heh. Body position-wise, I'm pretty happy with my lower body after my CSS revelation last year. But I'm still finding I'm not screwdriver handing and relaxing over the tank consistently enough, so most of my photos have my head position fairly high up. Ran a day best of 1:58.2. Considering that Keigwin's asks for 1:48 to 2:00 for all size bikes in B+ (also, what is up with this Stanfurd grade inflation to A/B+/B- from A/B/C or A/I/N (sorry, not sorry, rivalry Big Game week)), I'm pretty happy to be within the time on a 300. Still, meeting some fast guys and AFM riders, I was reminded of all the work that I still need to do for my riding. Learn the west coast tracks. West Coast red flags mean track stoppage whereas East Coast red flags mean everyone pits in. I actually like this rule as it probably significantly shortens the time to roll the ambulance and gives at least a fighting chance before permanent damage if there is heart stoppage. Not all tracks do that, Chuckwalla Red means slow down exit track quickly safely. It really depends upon organizer too. On the exact same track, say... Thunderhill or Buttonwillow, most track day providers have red-flag as stop on track. Whereas with AFM Racing, red-flag is go to pit. Ah. Okay. Good to know. Guess that's why the riders meetings are important. Always learning. 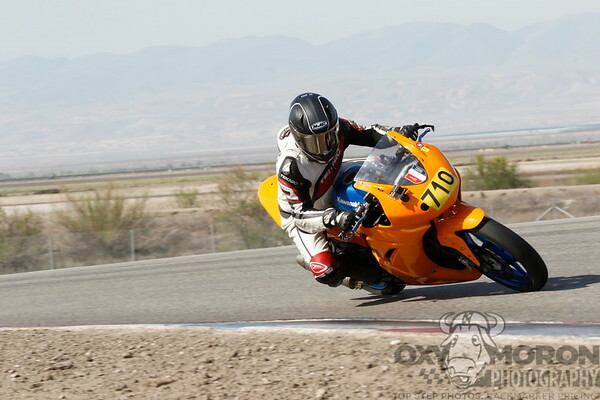 A little overdue on the write up, but I had a great two days at California Superbike School. Every time I go, I learn something that fundamentally changes the way I ride. 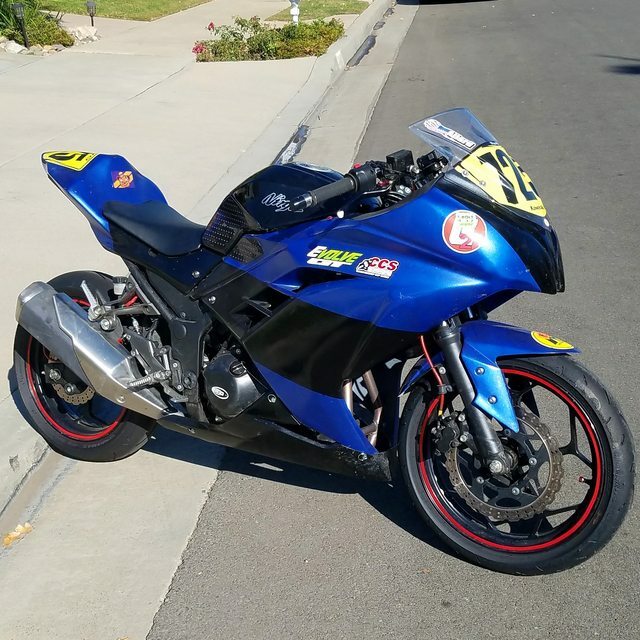 It's funny how after getting my license in 2006, riding trackdays, and even racing in CCS, I spent the weekend retraining my mind on how to look at corners. This was my sixth and seventh days at the school. It was also my first time on the S1000RR. It was pretty zany to think "this is max speed on the 300" halfway down the straight while still accelerating like crazy. I got to meet @Misti and was lucky enough to have her as my coach for both days. She had to put up with all my random questions, and also give a lecture after an ill-advised pass attempt on another student by me. My level four consults with James and Connor were really helpful in working out how I was mentally approaching my riding, and finding drills to rewire my brain. The level 4 consultations have fast become one of my favorite things about the school. It is awesome to get a whole second round of discussion after meeting with your riding coach. It is also cool to sit at the table and hear about everyone else's lesson plans. The biggest mental rewrite was to two/three step sooner and focus less on the turn-in reference point. Through all the years, and the stories of Nicky Hayden hitting a 6 inch wide turn-in area and Lorenzo riding along lines drawn by his dad, I've always found myself hunting for details for a specific turn-in reference point. Riding with Misti and doing the drills, it opened my eyes as to how much I was giving up in terms of mid-corner visuals. Before, I was doing the body pre-position, doing the head turn before hitting the turn-in point, and thought "this is the right technique." Shifting the focus from trying to hit a highly detailed turn-in point to looking ahead once I know I will hit a general turn-in area helped a lot of improving the mid-corner reference points and getting a better drive out. In hindsight, it's funny how I ended up back at the "uncool" things to work on in level 4. All too often, track time turns into discussions of taking certain lines, hitting a particular apex in a certain way, or working on body position. At the end of the day, all the drills that lead some riders to complain about the pace at CSS in level 1 are the fundamentals that result in safer riding. (Yes, I guess you can say I have drunk the kool-aid). Off-track, Cobie and Tim Johnson spent a fair bit of time with me on the slide bike. Eventually, we got it, and, funny enough, it really just felt like riding a dirt bike. I know everyone says it, but I was previously mentally concerned by the difference in bike sizes. They are running a touring tire with high pressure at fairly low speeds, so it's not exactly like it will be on track, but I hope all these incremental training pieces will help my reflexes if I find myself in a sliding situation. Now I just need to keep working on learning front end feel. In the future, I still hope to get out to Yamaha Champion Racing School, but their weekdays only camps make it more difficult to find time from work. I'm not sure what my riding plans will be this year, as I have to prep for the California bar, but I may be joining a rag-tag endurance race team later in the Fall. Also, if anyone is like me and hasn't been to Willow Springs in a while, the old Antelope Valley Inn And Conference Center is gone. But nearby is an America's Best Value, which is turning into a Motel 6 soon, that has a large parking lot for easy trailer parking. She had to put up with all my random questions, and also give a lecture after an ill-advised pass attempt on another student by me. Welcome to the "Lectured on a bad pass by @Misti" club. @Momaru and I have your membership card ready. GREAT WRITE UP!!! THANKS SO MUCH Really nice meeting and working with you and great photo to remember the days!! Great report, makes me want to do that class now! What did you guys do that was considered bad passing? Welcome to the "Lectured on a bad pass by Misti" club. Momaru and I have your membership card ready. Haha. A select club, we are. Mine was a late attempt at an inside pass prior to the apex on a downhill left hander. I stood up the other student after he started his tip-in. We were pretty even across a lap with some give and take, and I thought I could get it done in time. I did not. Haha. Momaru and I both did a pass coming out of turn 8 at the Ridge -- it looks like an "opening the door" pass but it cuts off the rider for turn 9 in a rude way. Now you know what we mean by planning ahead or thinking one or two corners ahead, maybe even setting up a pass a whole lap in advance. "Where are you and your bike going to be in two turns?" Surpassing this milestone will add a HUGE margin of safety to your track riding. What are the usual barriers to passing? What tends to prevent smooth, seamless passing?